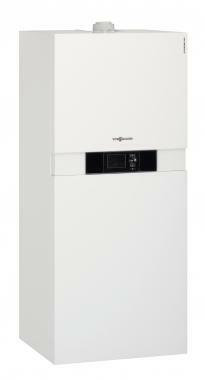 The B2TB Vitodens 222-F is a storage combi gas boiler by Viessmann. This boiler is a condensing floor standing boiler, and is able to fit as a standard kitchen unit with its small dimensions. This boiler has many ways to make it an extremely reliable model with it having an efficiency rating of 89.5% and an output rating of 35kW, making its energy efficiency class B and its energy efficiency class DHW heating A as well. This boiler has a high level of DHW convenience, this is done through its integral loading cylinder. As well as this it comes with a power saving high efficiency pump helping it to be the highly efficient product you would expect. As well as this the Vitodens 22-f is an extremely user friendly model with it being super easy to operate when used with the Vitotronic control unit which has a 5 inch colour touchscreen. As well as this it comes with the option of having it installed with the vitoconnect 100 WLAN adaptor to help you have better control over the internet or via an app on your smartphone. This boiler also comes with 3-5 years warranty so you can be sure you have brought a reliable boiler.